Announcing the next Abernethy CEO! On Phil Simpson's announcement of his intention to retire later in 2019, the Abernethy Board of Directors appointed Macaulay Search, a recruitment agency who specialise in high level appointments in the Charity, non-profit and Christian areas. We are very grateful to God for his provision of them and to the generous donors that allowed the cost of this process to be fully covered. Our Board of Directors are thrilled to let you know that Mike Causey will be our next Abernethy CEO! 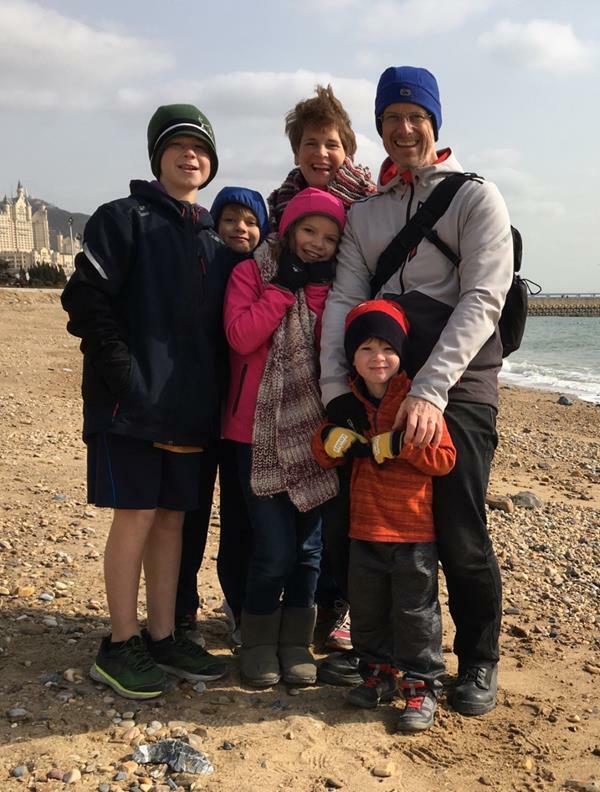 Mike and his wife Rachel have served in China since 2015, living in Tianjin with their four children – Caleb (11), Heidi (10), Jonah (8) and Barnabas (4). During this time Mike has worked as Director of Leadership Formation for the international education consortium, LDi (more below). Mike comes from the Lake District, and his wife Rachel from Herefordshire. He studied Management and Mathematics at university and has since gained a number of professional qualifications and training in leadership, personality strengths and safety & security. He spent 10 years in financial services, building his experience first through accounting, then technology management, before moving onto project and compliance management. Mike is a keen runner and has done a number of marathons and ultra-marathons. He is most passionate about mountains and winter climbing. For a number of years Mike worked for BP, leading the risk management, governance and compliance work for a part of their corporate services. Alongside this, with his wife and a number of other families, they planted a new church in their village in south west Surrey and founded and operated a coffee shop and farm shop nearby. One aspect of Mike’s work in China was leading an experiential education centre in the mountains, northeast of Beijing near the Great Wall, to provide a safe and secure space for the ‘good news’. Through high ropes, climbing, camping, games, sports, and teaching, to both corporate and educational groups drawing visitors to sense the wonder of His creation, and the call to worship. More recently he has also been LDi’s Director of Safety and Security. "..it is with wonder, delight and a deep sense of privilege that I look forward to taking up the role of CEO of Abernethy. The Trust is clearly a place of faithfulness, and much opportunity for the good news, where the mission to seek the abundant life promised by Jesus, is naturally matched by a need for a deep practice of being and making disciples. Spiritual habits; bold love that overcomes fear with faith; and locations infused with the hospitality of Christ-like community - these are the priorities I can’t wait to engage in, whilst learning the many more aspects of Abernethy that are drawing others to Him." The Board have been overwhelmed by the number and quality of the applications that were received for the CEO post. These were eventually narrowed down to four superb final candidates who the Board spent a good deal of time with last weekend. Eventually, and after much prayerful consideration, the Board came to the unified view that Mike should be offered the role of next CEO. Mike and other senior leaders within the Trust will lead a refreshed and more intentional emphasis on creating a flourishing missional community of staff who will eventually go out from Abernethy bolder, more equipped and empowered to live and share their Christian faith in whatever place they find themselves. "We are extremely grateful and wish to express our sincere and heartfelt thanks for the widespread prayerful support and encouragement that has been so evident throughout the recruitment process. The Board, along with the whole Abernethy team, will be looking forward to welcoming Mike and his family in a few months’ time." As Mike and his family prepare to leave China and start a new life in Scotland, please do pray for them. We will be in touch with further news on timing in due course. You are receiving this email because you subscribed.